The days of gathering in the forum are long gone. Today, the sphere of American civics is teeming with new forms of participation—from emergent advocacy organizations like MoveOn.orgi and shifting information paradigmsii to “personalized politics”iii and debates centered on computational data.iv Civics has moved beyond a notion of informed citizenship—of being educated on issues and debates, as well as keen enough to synthesize and respond (hopefully in the form of votes) to shape government. Now, in order to hold elected officials accountable, or to expose the shadowy ongoings of bureaucrats, or to reimagine a government suited for the pace of the 21st century, citizens must lead the charge to actively craft political opinion, civic life, and government itself. Of course, civic engagement has never been as straightforward as our historical fantasy of the public forum—there have always been barriers to gaining and retaining access, to presence and participation, whether you’re showing up to a neighborhood meeting or a hackathon. “Showing up” is a cultural practice that is complicated and contingent. Today, computational technologies present special kinds of challenges to participation. To understand emergent cultures of citizenship, researchers also have to struggle with the issue of how to show up. As contemporary civics changes, the role of the ethnographer is increasingly important as it continues to highlight the embodied, informal, and unspoken problems citizenship, particularly with regards to the problems of legitimacy and equity that precede participation. Here I offer two stories from my years of fieldwork at a variety of civic events to explore the central problems of gaining and retaining access. 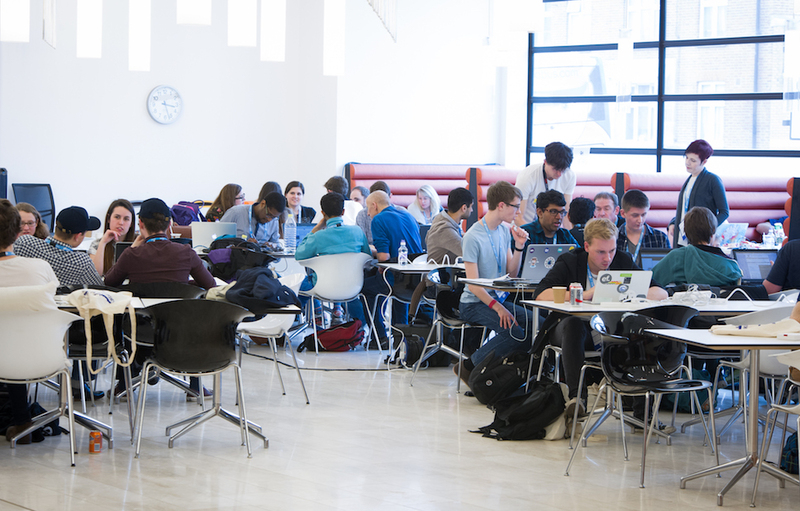 One new form of civic participation is the so-called civic hackathon.v In general, hackathons are short, intensive programming events that typically last between 24 and 48 hours. 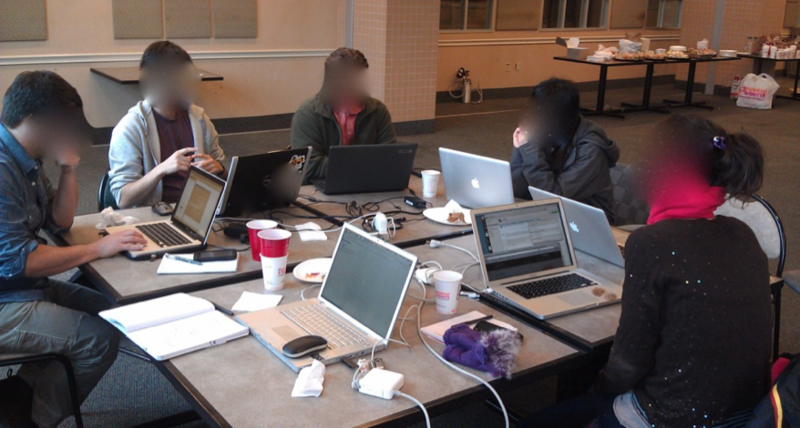 Often taking place over a weekend, these events gather individuals who form temporary working groups to create software. At the end, working groups present their creations, which are typically very rough prototypes or plans rather than fully functioning applications. The technological terms of citizenshipx present huge barriers of access. When I first endeavored to attend a hackathon, I was skeptical of the “Come One, Come All” catchcry. At the event, located in an old pharmaceutical building in Brooklyn, I joined a working group focused on using a database of entomology records. With some professional work as a front-end designer and developer in my résumé, I assumed I could adequately participate. Yet, the database was large and unwieldy, and only one person within the group of seven had the technical expertise—as well as the software—to parse through the database. Another person in the group—a gifted graduate student in data visualization—was the only person able to properly produce network diagrams to show the connection amongst entries. In the end, my role became simple: I spent the majority of the two-day event uploading data to a web-based mapping platform. My computer endlessly sent packets and reported errors, and I spent my time asking the experts to change things I couldn’t do myself. Clearly, civic hackathons present barriers to entry to a broad public. They emphasize a type of technologicalxi or entrepreneurialxii citizenship that undervalues other nontechnical or non-entrepreneurial ways of seeing the world. These barriers also exist for ethnographers. In showing up the event, I participated in a meager way. As much as uploading could be done by anyone with a basic knowledge of web browsing, this task became mine because I could not partake in the more technical work. My presence translated into eagerness, and I took on a task that was available, necessary, and otherwise undone. In reflecting on the event and my participation, I felt cheated. This feeling presented an obvious question: Had I attended under different circumstances—that is, not as an ethnographer—would I show up again? The answer would likely be no. I recently sat in a two-day workshop to brainstorm ways to make Atlanta, Georgia (USA) a “Smart City”, that is, a city enmeshed and augmented with various computational technologies. The purpose of the workshop was to “share thoughts and ideas” about a smart Atlanta in the inevitable years-to-come. With so much hope, the sober opening remarks reigned things in: “There are no bad ideas, but we need ideas we can execute.” The workshop aimed to bridle technological evangelism and blue sky thinking with rubber-hitting-the-road pragmatism. The organizers seemed well aware that a workshop about the future of a city would inevitably migrate toward the fantastical: autonomous ambulances and governments in the cloud. The workshop organizers and the team from the city were in no way dethroning big data and the Internet of Things as the future, but instead trying to build a bridge between the here-and-now and the brighter there-and-then. The organizers emphasized that only through actionable policy, projects, and procedures in the short term could Atlanta ever become smart in the long term—after all, a Smart Rome wasn’t build in a day. With a goal of “shap[ing] our future”, the emphasis seemed to be on community: “Let’s not think of our silos today”, a member from the organizing group advised to the room 27 attendees from various offices, departments, and affiliations around the city. “Today, let’s think of each of us as Atlantans.” Following the introduction, all the attendees addressed the group with their name, position, and aspirations for the workshop, echoing this community orientation: A smart Atlanta is, of course, “more efficient” but also, and more importantly, better engaged with citizens. Yet, in trying to envision a city of the future that better engages citizens, the two-day workshop failed to get citizens in the room. Although citizens figured into much of this early discussion, throughout the two days no one in the room identified as a citizen, at least not in the way the category of citizen was being used. The citizen was an absent body that was referred to in passive and displaced terms: as one attendee put it, “All that we are doing here is for our citizens.” The term citizen signified a bodied recipient of well-intentioned programs, a body that was rendered apolitical by the all-encompassing vagueness of smartness-qua-computation. In being invited to attend in my professional capacity as a postdoctoral fellow, I needed to tow a line with regards to my opinions about citizen engagement and what I was there to observe. On day two of the workshop, small groups formed to generate proposals for short- and medium-term projects. Selecting from a small batch of ideas, each group created four proposals that took the form of one-page worksheets. The ideas ranged from a comprehensive data portal to citywide information graphics to the introduction of neighborhood feeder buses. These proposals were presented to the remaining group, and were to be used in a subsequent meeting with higher-order city officials. In the exchange about “all of the data” and the overall lack of specificity with regards to who all of this work was for, I kept returning to the terms of my own participation in the event. As an invited party, but one who wanted to maintain an invite, I ultimately chose to remain quiet in spite of the immense responsibility I felt to provide glimpses of the citizens who were not there. As a citizen of the city of Atlanta myself, I found the proposals to be off-base and well-worn promises of apolitical technological progress. I, for one, had no interest in accessing city data about business licenses, a proposal I helped to scribe. Did that make me not a citizen, or did that highlight my inability to envision the value of this data? As a citizen, I wanted proposals that had an attenuation to more than generic data and generic citizens; instead I wanted proposals that tackled issues of equity and injustice. However, as a participant-observer of civics and an invitee, I had other commitments that I chose over my split identity of citizen and ethnographer. As a result, and like many in the room, I too had to renounce my citizen identity to maintain a professional one. These two examples reveal the emergence of new terms of citizenship, but also the continuing importance of ethnographic praxis. Many civic gatherings I’ve attended emphasized that anyone could show up, frequently using the rhetorical ploy that information and communication technologies are universal operators and democratic connectors. As much as any egalitarian sentiment is always utopian, showing up at these particular civic gatherings points out that not only is this sentiment not fulfilled, but it is, in fact, unfillable. These events, with their focus on computation, are not truly for everyone and anyone as they privilege and proselytize a specific breed of citizenship and hegemonic vision of future. These instances of technologically dense civics do not change what it means to be an ethnographer overall. The same problems of gaining, retaining, and reporting on access persist. However, in this moment, the role of the ethnographer of civics has shifted like civics itself—increasingly technical, increasingly contingent, and increasingly specific. As a result, the imperative is to continue to provide accounts of these new settings, but also to revisit and reconfirm these sites of interest. With various backgrounds and training, accounts of civic events are like citizens themselves—idiosyncratic, detailed, and varied, ultimately constituted by who and what shows up. i. David Karpf, The MoveOn Effect: The Unexpected Transformation of American Political Advocacy (New York: Oxford University Press, 2012). ii. Chris Wells, The Civic Organization and the Digital Citizen: Communicating Engagement in a Networked Age (Oxford University Press, 2015). iii. W. Lance Bennett, “The Personalization of Politics Political Identity, Social Media, and Changing Patterns of Participation,” The ANNALS of the American Academy of Political and Social Science 644, no. 1 (2012): 20–39; W. Lance Bennett and Alexandra Segerberg, “The Logic of Connective Action: Digital Media and the Personalization of Contentious Politics,” Information, Communication & Society 15, no. 5 (2012): 739–68. iv. Andrew R. Schrock, “Civic Hacking as Data Activism and Advocacy: A History from Publicity to Open Government Data,” New Media & Society 18, no. 4 (April 1, 2016): 581–99, doi:10.1177/1461444816629469. v. Thomas James Lodato and Carl DiSalvo, “Issue-Oriented Hackathons as Material Participation,” New Media & Society 18, no. 4 (April 1, 2016): 539–57, doi:10.1177/1461444816629467; Melissa Gregg, “Hack for Good: Speculative Labour, App Development and the Burden of Austerity,” The Fibreculture Journal, no. 25 (2015): 185–202, doi:10.15307/fcj.25.186.2015; Lilly Irani, “Hackathons and the Making of Entrepreneurial Citizenship,” Science, Technology & Human Values, April 8, 2015, 0162243915578486, doi:10.1177/0162243915578486; Carl DiSalvo, Melissa Gregg, and Thomas Lodato, “Building Belonging,” Interactions 21, no. 4 (2014): 58–61. Thomas James Lodato is a postdoctoral fellow at the Center for Urban Innovation in the School of Public Policy at the Georgia Institute of Technology. 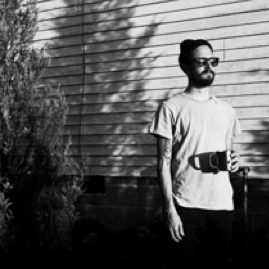 He researches contemporary knowledge workers, with particular attention to the material culture and practices of creative work and the civic implications of the gig economy. Lodato is currently conducting field work on coworking spaces in the United States as well as following local smart city efforts in Atlanta. He lives in Athens, Georgia with Sara and St. Francis. “Hey, the water cooler sent you a joke!”: ‘Smart’, Pervasive and Persuasive Ethnography, Nimmi Rangaswamy et al.